Click on any of the categories below to see sample eCards. All eCards can also be made into invitations. It's almost holiday time - are you ready? It's never too early or too late to send a CorpNote holiday greeting card. While the winter holidays tend to be our most popular (Thanksgiving, Christmas, Season's Greetings and New Year's), our customer's also send greetings for many other holidays as well. Our second busiest time of year is Valentine's Day, where many of our cards focus on the concept of "we love having you as a customer." 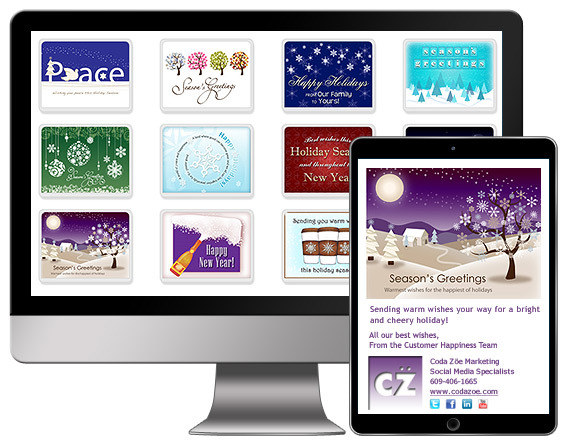 If you are new to holiday eCards, check out our complete guide: Everything you ever wanted to know about sending Seasons Greetings and Holiday eCards. Topics include the best time to send Holiday eCards, the difference between still and animated eCards, and how to post eCards in Social Media like Facebook, LinkedIn and Google+. Browse samples of our eCards by clicking on any of the categories above. 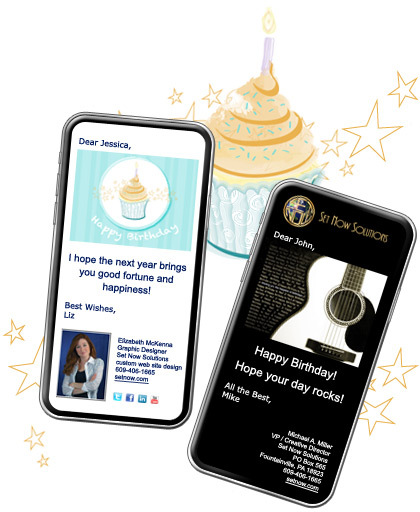 If you already have an image or picture that you would like to use as your design, you can upload them into CorpNote and send them as eCards or invitations. Birthday and thank you eCards are generally the top two occasions for which people send our greeting cards. With CorpNote, you can easily create birthday eCards and wedding or employment anniversary eCards and schedule them to be sent on your contact's special day. To ensure you never miss sending a birthday eCard or anniversary eCard, our service includes a Recurring eCard feature that enables you to easily completely automate the process of sending your eCards year-after-year. 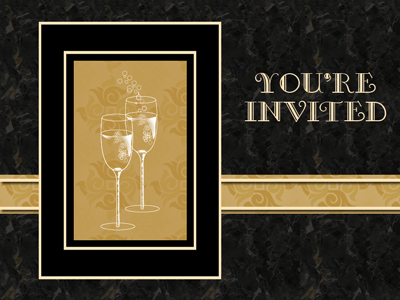 Any eCard can be made into an online invitation. Our service enables you to easily create an unlimited number of professional, advertising-free invitations and see your guest responses in real-time. You can also download and print event guest lists as well as send follow-up messages. CorpNote is built for business and is an advertising free solution that you can customize with your company logo and colors. Our online invitations and surveys are all seamlessly tied into our eCard delivery system, and our online address book makes it easy to plan, launch and follow up successful online campaigns. With thousands of satisfied customers, we've seen many innovative ways to use eCards to grow a business. From trade show invitations and event management, to customer service surveys, to employee recognition, CorpNote makes it quick and easy. All of CorpNote's built in features allow you to view results in real time and create helpful reports to analyze your success.